Olympia Time: What went on with rural growth in Thurston County? What went on with rural growth in Thurston County? It wasn't a member of the Thurston County commission, but there was a county commissioner at a recent hearing on exempt well bills last month. One of our commissioners was there too, but the Mason County commissioner said (and I'm paraphrasing) that the county's economy needed a boost. What she was talking about was that building houses, more people living in the rural parts of Mason County would give their county a boost. Despite evidence to the contrary that rural residential development is good for the government bottom line or anyone's economic well-being (I mean other than homebuilders and realtors) it did get me thinking about the rural landscape and how it's either being put to work (with farms or logging) or put to rest (by building houses). What I see are a couple interesting things. One, no one seems to keep track of land in active forestry by county, which is really weird since it is literally taxed differently in Washington and county assessors should really care about that. I was able to find two data points, so it's just sitting on the chart as something I'd like to add in if I can find it. Also, I also wasn't able to find was any sort of description of residential zoning by acreage, so I used general non-incorporated population as a stand-in. This might be slightly unfair since most of this population is concentrated up in Tanglewild. But, as you can see in the gif at the top of this post, even Grand Mound has seen some significant changes since then. 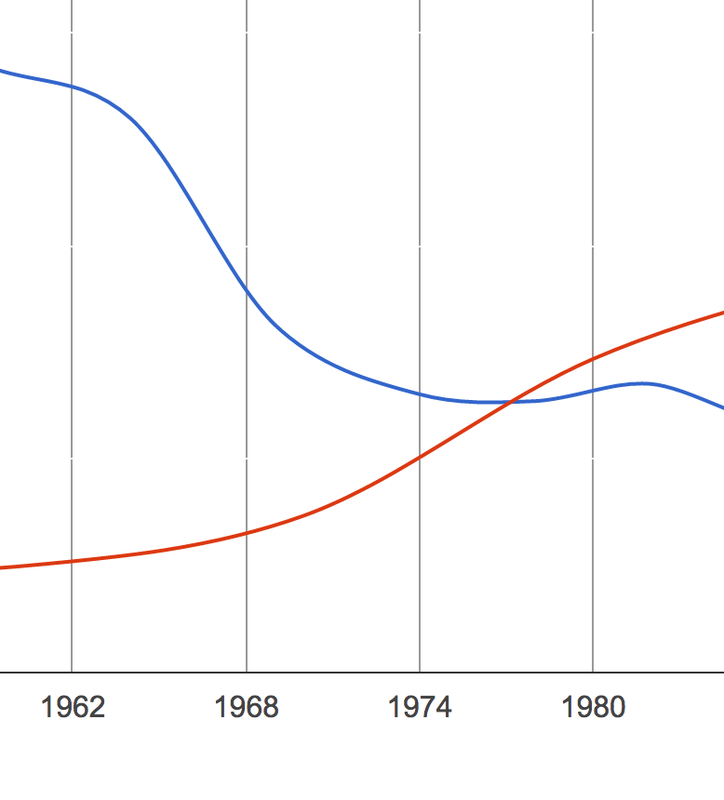 Two, the 1960s seem to be a big turning point in the change of how Thurston County's rural areas were in terms of a shift from farming to rural growth. If you zoom in on the 60s, you see the drop off of farm acreage happening just as non-city residential growth picks up. 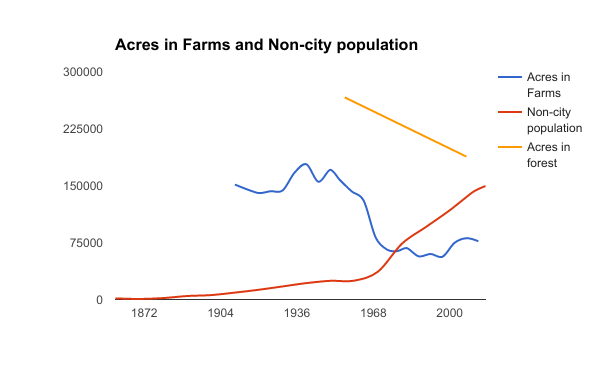 What is also interesting is that even as no it seems like farm acreage has stabilized, the non-city population continues to increase, which means the rural areas are either getting denser or they're overtaking acreage that isn't in active farming. Lastly, and this is more of a fun fact than anything. I wrote years back about the unincorporated area east of Lacey was Thurston County's invisible city. I used to talk about this when I was on the Timberland Library board of trustees about how we should expand library service between Rochester and Grand Mound (which is currently served by a kiosk). But, that if you took the two census tracts that surround Highway 12 between I-5 and the county line, you'd have the fourth largest city in Thurston County at almost 13,000 people. Farming complemented work in the timber industry, broadly defined (including sawmills, plywood etc). I think it was a common pattern in Thurston County for people to have small farms that women/families worked much of the time, and men in off-seasons. Maybe there is a direct link between the decline in timber employment and the decline in farming. Certainly there is a broader link in the sense that both were subjected to similar economic forces.